On Saturday, my Boyfriend (Mr Sugarpuffish) and I made our way up to London to visit The Allergy & Free From Show. Armed with our now infamous trolley, I was full of beans, like a toddler on Christmas morning. Every year the show gets bigger and better and you may remember I mentioned it is now several shows in one, with V Delicious and the new Love Natural, Love Organic Shows running alongside. I think the negative feedback from last year had been taken on board by the organisers. The venue was bigger, there was more room and I only noticed the crowds in a few corners which felt a little cramped between stands. I ended up spending five and half hours at the venue mainly because I wanted to meet with twitter friends and catch up with my favourite brands. It’s so nice to give everyone a hug and have a good chin wag. Here are the friendly faces I met and links to websites/blogs etc. Nia (Carrots & Maple Syrup) - she’s an amazing bubbly young lady with a big heart who deals with many allergies, plus an amazing cook so check out her blog. Nicola N1C79 Eats! - my twitter partner in crime for milk & egg free finds and she now has a blog. Hailey - Founder of Allergy Adventures and she makes me want to be a kid all over again. Her brilliant company helps children (and parents) tackle allergy education in a fun and colourful way. Alex Gazzola is deputy editor of Skins Matter, a health writer specialising in allergies and co-ordinator for the FreeFrom Skincare Awards. He does a brilliant job behind the scenes for the awards. I think the Love Natural, Love Organic show was a great addition because it attracted more skincare companies than I had seen in previous years. 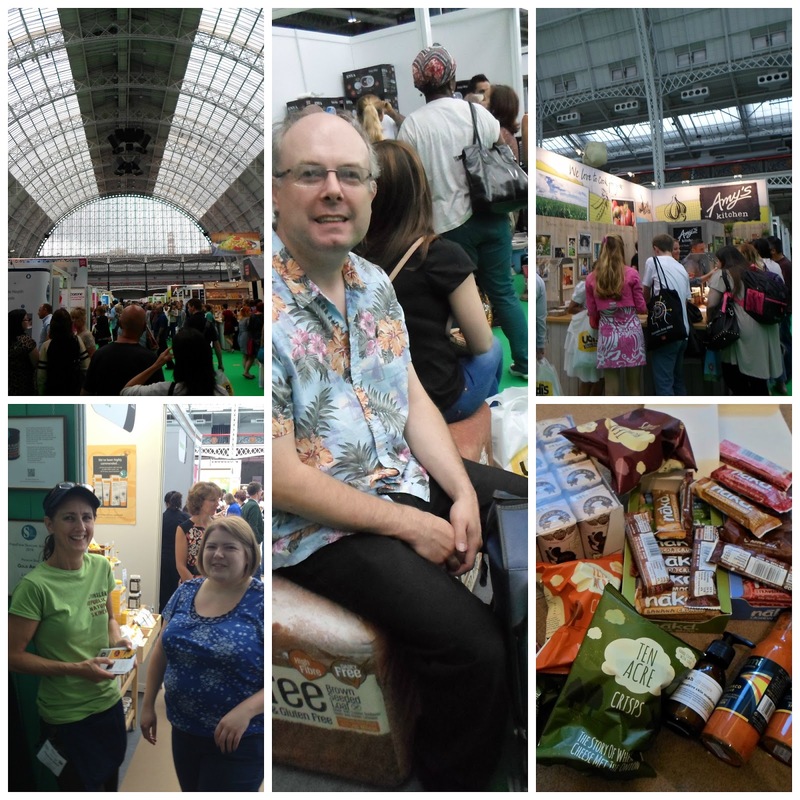 It did mean I was surrounded by brands I review and love and some that I judged in the FreeFrom Skincare Awards. I chatted with Odylique, Lyonsleaf, Adore Naturals, TouLou, Dash Skincare, Greenscents, Kris D’Amour, Bathing Beauty and Oh Organics. I bought a bottle of Dash Skincare Sensitive Skin Moisturiser to try but I didn't go crazy buying lots of skincare because I need to use up what I already own. LNLO sparked an interest with many of my fellow green bloggers which means you will see more blog posts floating around but that can only be a good thing. Rubys of London - a Vegan Patisserie also specialising in wheat, gluten and sugar free. I found this stand late in the day and most of the stock was gone. I bought a Raspberry Coconut cupcake and it was divine (pictured above). If you live in London get yourself down to Greenwich Market. Freego - an online 'supermarket' for gluten free products but I was informed they offered many products catering for other allergies/intolerances. Mr Sugarpuffish’s taste buds were tingling for chocolate, every time I turned around he was tucking into samples. I asked him which ones stood out and his vote goes to Pana Chocolate (vegan, gluten, dairy & soy free) and Cocolo (fairtrade & “may contain milk” warning for the dark chocolates). For me, the Allergy Show will always be a great day out because it fits my lifestyle and ethos. I am always looking forward to the next one as soon as I get home and put my feet up. If you were at Olympia this weekend, leave me a comment below, let me know what you bought and if you wrote a blog post leave a link so we can all go and check it out. Looks like you had a really lovely day! Me and Katie couldn't resist splitting a brownie from Ruby's stand, so scrum! I feel like the whole day was a blur and I missed a lot of things :-( I deliberately booked a late train in and early train out because I was on my own and because I am anticipating a big. long one next weekend.. Next year I will make much more of a day of it, possibly even stay with a friend that lives in London so I can get there early and/or leave late. It's booked in the diary already!! Trust me over the years I've picked up tips & ticks for visiting to the show (hence the trolley & our secret parking spot) so you always ended up planning better for the next one because you now know what to expect. If you are still talking to me next year ;-) you're always welcome here & we'll drive you up although you would have to listen to Mr Sugarpuffish & I arguing over his driving lol. Glad I made you laugh :) The show is now huge it definitely requires a good few hours, it was the longest time I'd ever spent there so goes to show how much it's grown. Silly Google didn't tell me you'd replied! I'd love to take you up on that offer! Sounds awesome! Luckily I got there pretty easily, Train, tube and then train again directly outside the venue!